Spring has officially sprung but we still have a few remnant snow piles hangin’ on for dear life. This time of year I find it harder to pass by the floral section of the grocery store without snatching up a few blooms. I can’t wait until I can clip fresh flowers from the yard, but for now I have to settle for store-bought. 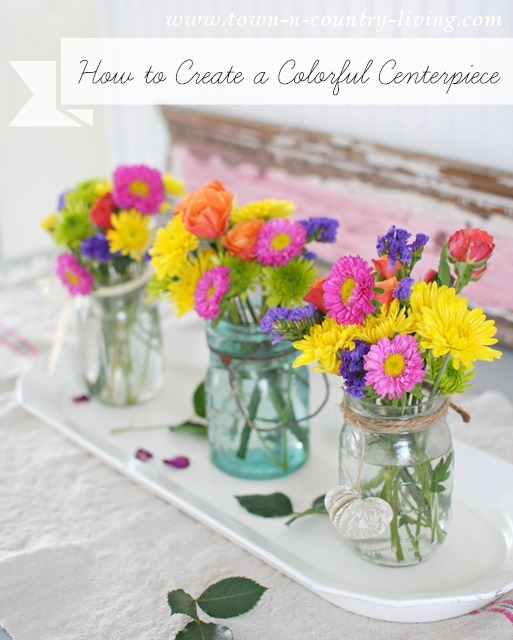 I thought it would be fun to show you how I created a colorful centerpiece with my latest bunch of cheery flowers. 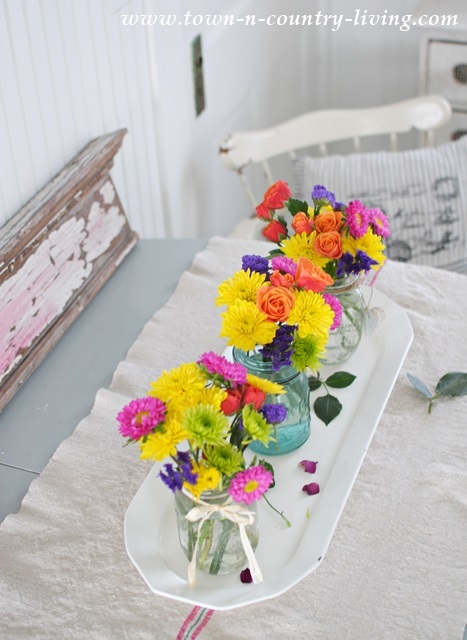 I like my flower arrangements sweet and simple … nothing formal or fussy. 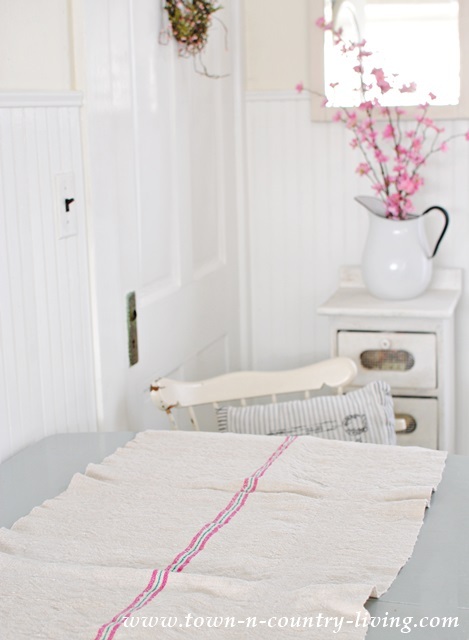 I started with a French grain sack type runner to soften the table. 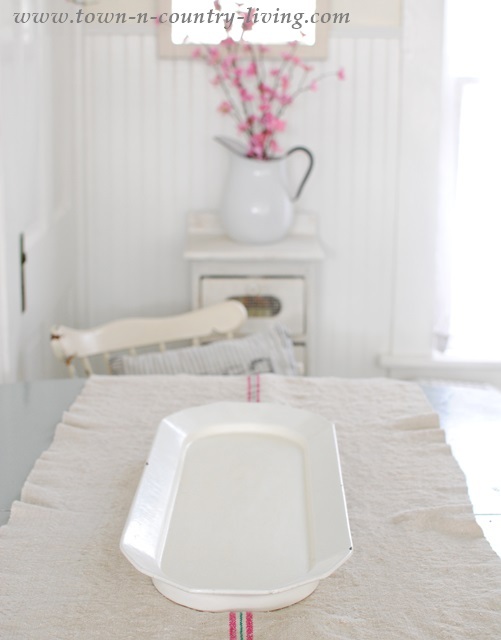 Then I added my white cast aluminum platter – a recent vintage find at the antique store. I like the mix of a hard surface against the softer surface – it’s unexpected. 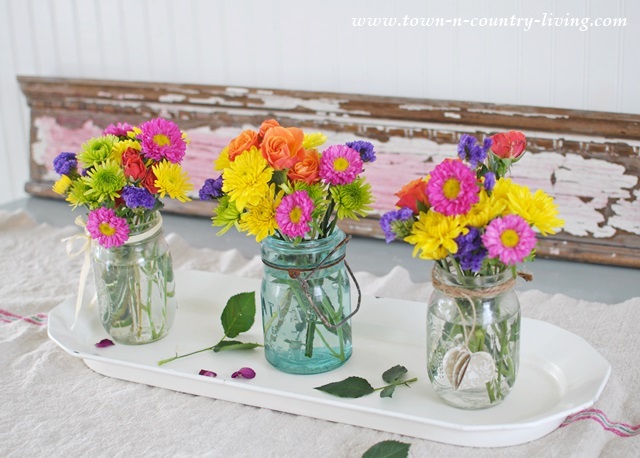 Then comes the fun of adding brightly colored flowers stuffed in mason jars. I used 2 clear mason jars, and one aqua. I purposely didn’t spend much time arranging the flowers. I wanted to keep them simple and casual. Each jar has its own adornment. This one wears a 3D paper heart tied with twine. And this one wears a simple raffia bow. The blue jar needs no embellishment. 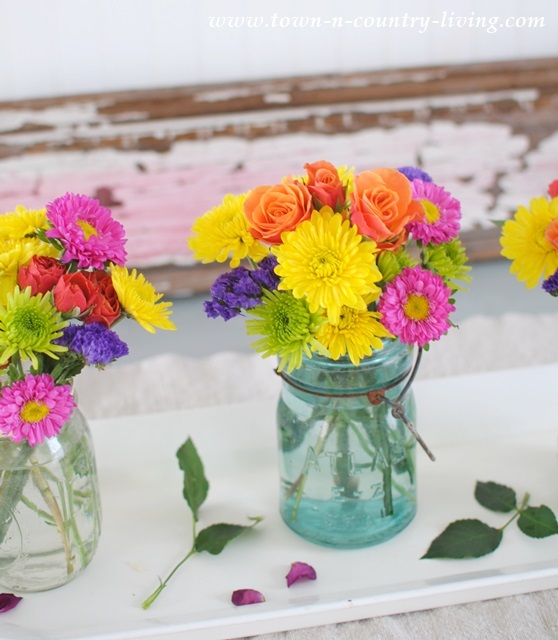 All grouped together, these individual bouquets make an impactful, colorful centerpiece. I love all these bold colors together! It really brightens up the room and makes me smile. 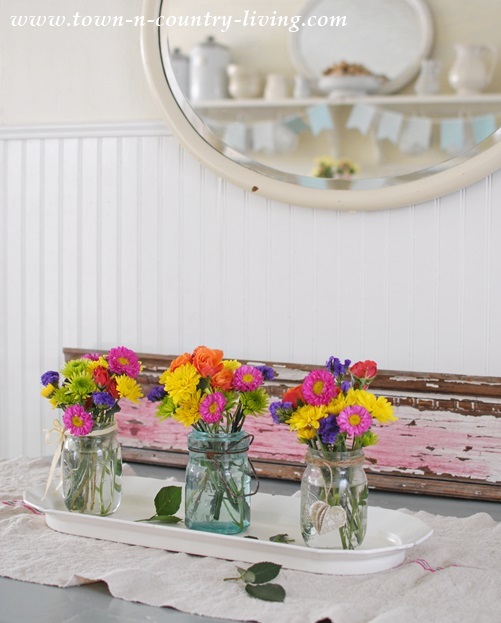 It’s funny how a simple gathering of flowers comes together to make a colorful centerpiece that brightens up my farmhouse kitchen as I wait for spring to fully arrive! It was in the 50’s today, but we’re expecting more snow next week. Sigh. Simple and beautiful. Love the tray. So pretty, I have resorted to buying flowers from the grocery store too. I just need a dose of Spring while this snow sticks around. 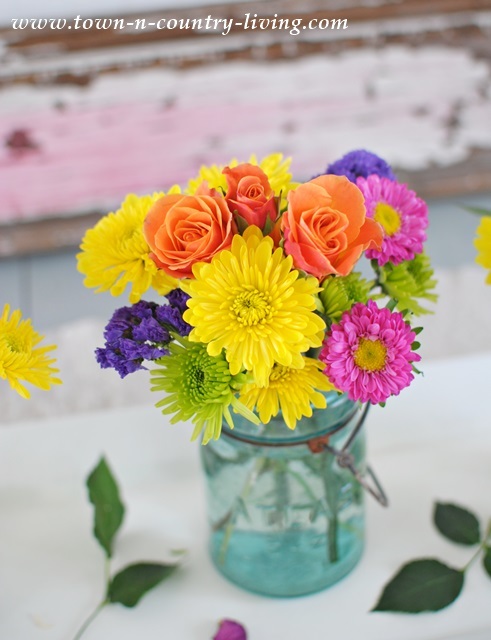 What beautiful sunny bouquets! They are so pretty and cheerful. 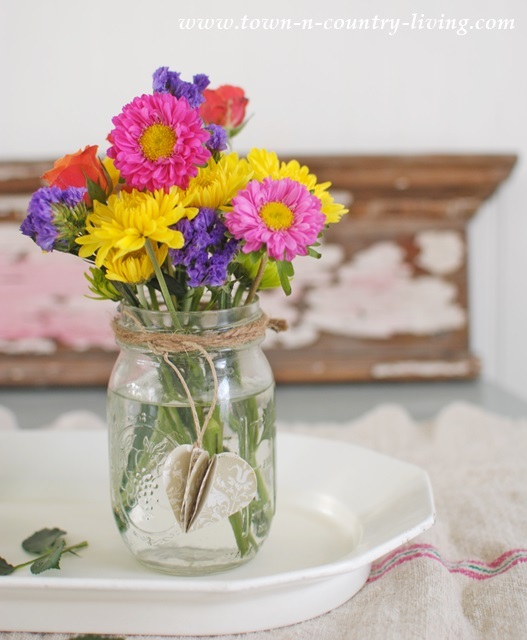 I love simple flower arrangements too and mason jars are perfect. Love the display of flowers. Does not take anything fancy but pretty flowers to brighten your day. 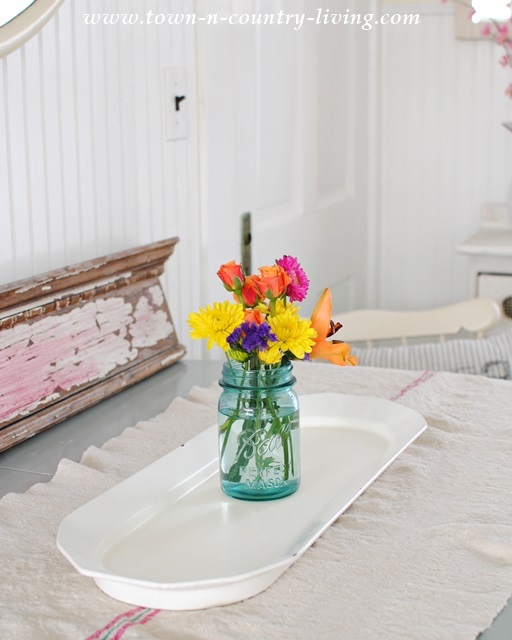 The platter is just perfect to show them off and the flowers show off the platter … win-win. Love it! So cute and cheerful. Perfect for spring. I always love your stuff Jennifer! So pretty! The simple flower arrangement is beautiful, and my eyes kept looking at that equally beautiful piece of vintage trim in the background…all chippy white with a swath of pink! I believe we are past our last freeze, but you can never be too sure that an unexpected cold front will swoop down from Canada all the way to north Texas. Hope your snow melts quickly and spring will finally arrive for you. Jennifer, this is gorgeous! so simple and perfect! I always love how you decorate. 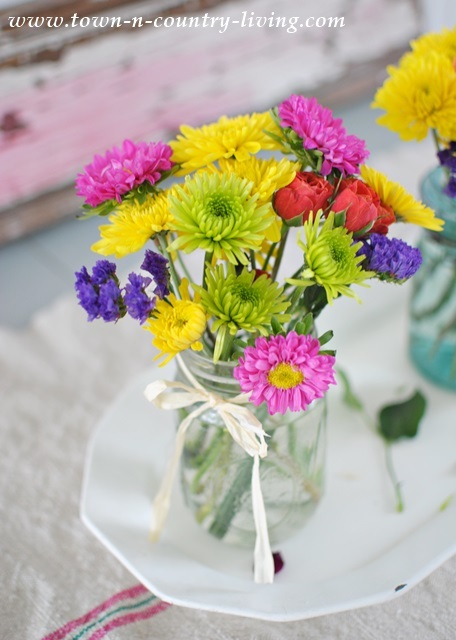 I really love the simplicity and the bright pops of color from the flowers! I just love having fresh flowers around the house. This centerpiece is so simple to put together but really adds a lot to the room. Beautiful!